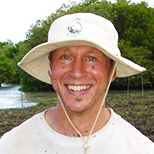 Mark Huxham is professor of teaching and research in environmental biology at Edinburgh Napier University. He combines research in marine ecology and ecosystem services with finding new ways to teach the importance and excitement of science. His work helped establish the Mikoko Pamoja project, which uses using ecosystem science for mangrove conservation and community benefit in Kenya.